How do I get my FREE Birthday Dinner coupon? I don't have access to email, can I still get a free dinner? My first email says I was born in 2008, do I need to fix this? Can my family and I join the Fishing Buddies E-Club while sharing one email address? I signed up a few days ago and haven't received anything from you yet, is this normal? 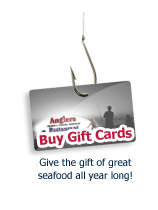 Anglers was closed on my birthday and I didn't get to use my coupon, can I use it another day? I love the way you make a certain meal (or dessert) can I get the recipe? I don't have access to email can I still get a free dinner? 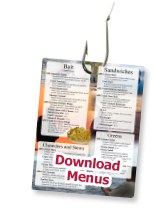 Our FREE Birthday Dinner coupons are given to our Fishing Buddies E-Club members as a thank-you for allowing us to email them throughout the year, while we wont offer a free dinner to non members we are happy to give you one of our famous desserts for free. No, we don't collect our customers' birth year. Our program completes your date of birth with 2008, so all of our customers appear to be born in 2008. While knowing our customers' age would be very useful, we feel as though it poses too much of a security risk sending out emails with your full date of birth contained inside.